It's been about a week since I last addressed you all, and with that, we got another 7" or so of new snow, which is always a welcome sight. Our monthly total now sits at 52" or, if you prefer, more than four feet of shred sugar. I can't even remember the ancient history that is January. That's probably a good thing. We're halfway through Vermont Week up here at the mountain, so if you're local, the kids are on vacation and you're trying to find something for them to do - obviously this is the case - then bring them up to visit us. We've got events going on through the weekend with some pretty cool people, so come get a balloon hat from Dux, take a snowshoe tour from the Nordic Center or do your best Iditarod impression on a dog sled tour - sans the heavy parka and foreboding dark, arctic atmosphere. The second half of the winter, from Mid-February to mid-March, is my favorite half. It's, like, almost daylight when I drive in to work now, there's actually a few other humans up and around that early and it's not even dark when I clock-out! Snow keeps falling by the truckload, temperatures are starting to mellow out a little and yet there's still plenty of season left. Personalities start to come out both in people's clothing and their faces, and it's pretty difficult not to have a great time on the mountain. It's awesome. We've added 2-4" in the last 24 hours, 7" since the time I last addressed you, and 45" in this month alone. We're about 98 percent open and I can say with confidence, that after testing our product extensively in the last week, these are the best conditions we've see all season. The groomers are soft and easy to edge, the trees are thin but fun with the proper caution, and we've let a few trails bump up, which adds a whole other dimension of enjoyment. Now, if only we could get this annoying wind to move out over the ocean where it belongs! Pretty soon, it will be March, another snowy month for us, and, before you know it, April will come calling and we'll be skiing and riding in tee shirts again. The season goes faster than you think, folks. So make an effort to get up here and enjoy the next two months. There's plenty of snow to go around, and if history means anything, it's only going to get better from here. So get excited like the colorful guy in the photo above. It's the best two months of the year. We're LIVE-TWEETING the Women's Snowboard Superpipe! It may not be Sochi, but we've got some fun freestyle of our own. What are you doing at 10am? Working? Fair enough. How about 12:30? Come on, that's your lunch break! Plenty of time to watch the women's snowboard superpipe final! You aren't fooling me. I really hope you've been watching the Winter Olympics in Sochi, Russia. 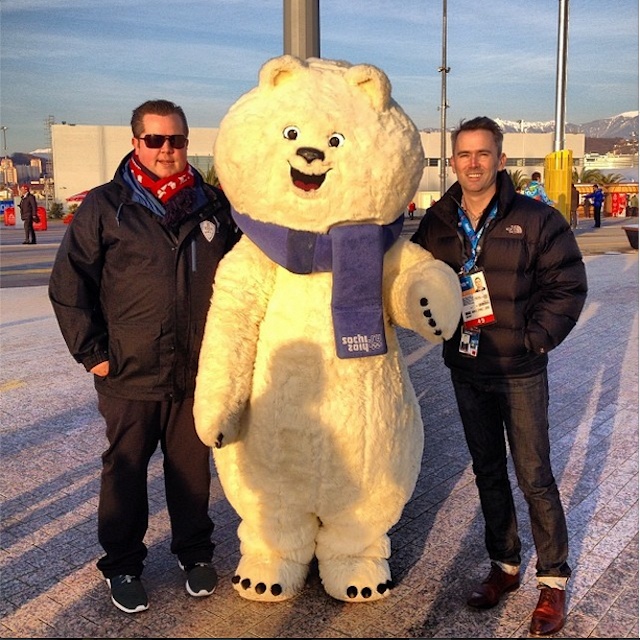 Despite so funny stories about facility issues, poor snow conditions and creepy bears that will haunt your dreams, the Games themselves have been pretty entertaining. Two of my favorite events to watch are the men's and women's ski/snowboard superpipe and slopestyle events. I missed the men's events, since I couldn't figure out NBC's schedule of events, but I think I've sorted it out just in time for the women's pipe. I have a tremendous amount of appreciation for how difficult those tricks are and it's always so impressive to watch these incredible athletes just send it 20' out of the pipe and boost off 50' kickers. They're two of the most popular and exciting sports to watch, often igniting millions of comments from viewers all over the globe. So I thought, why not join in the conversation? Follow @boltonvalley on Twitter for a live chat during the women's snowboard superpipe today. Use the official Olympic hashtag (#Sochi2014) as well as #BVSochi and chime in with your armchair analysis, observations and comments during each run. We'll follow along as the world's best vie for Olympic Gold! Semifinals are live at 10am and the final begins at 12:30, according to NBC. You can stream the event online for free at stream.nbcolympics.com. A sea of freshies on Lower Tattle Tale! But, seriously. It took 17 days in January to total up a foot of natural snowfall, and we've already seen that much during the first week of February. Timberline got open, we're at a season-high of open terrain, and while we're still waiting on one more good storm for Wilderness, it's no longer a questions of "if", but rather, "when" that will open up. I tell ya, the next month-and-a-half are going to be the best snow months of the season. They always have been, and the stage is set for history to keep on repeating itself. What can I say? When I'm right, I'm right. January's biggest problem was that its weather patterns were about as stable as a one-legged chair in the middle of an oil slick. February has righted those wrongs and we've seen pretty normal weather over the last 8 days. Pretty much every day this month, it's either been dumping snow or bluebird skies. That's my kind of forecast. After three consecutive days of sunshine, today brings a chance of flurries again. See what I'm saying? This also makes it a heck of a lot easier to talk about the weather because, ya know, we can actually sort of predict and follow it again. Today will be a little warmer than yesterday, but not much, and Monday might bring a passing flurry or two as well. Tuesday and Wednesday look bright blue again and there's a little something something brewing for Thursday that we're keeping our eyes on. Stay tuned. I'm exhausted from all the powder riding I've done this week. Wednesday - Thursday were arguably the three best days of the season so far, and with freshies over the boots in most places, it's gets pretty tiring to ride after three solid days. So many powder laps off Timberline down Sure Shot and Lower Tattle Tale (photo above). First World problems, I know, but still. What you should take away from this is that the skiing and riding has never been better, and even four days after Winter Storm Nika, there's still some first tracks and powder stashes to be found out there. With 51 trails and 5 lifts up and running, you should be able to make yourself as tired as I. Two important notes: 1) Timberline looks great when you're riding up the chair, but I promise you there's only 12 inches of fluff on closed trails. Underneath it's all rock. Respect Ski Patrol's ropes. They're up for a reason. 2) The trees are not ready. Again, it's powder syndrome. I'm dying to get my glade runs in just like everyone else, but not at the expense of my health or equipment. It's just too thin underneath. One more big storm, and that might change, but right now it's just not there yet. Sad face. In one word: halted. We finished up work on Cobrass the other day, and that trail opened up yesterday. Snowmaking crews wanted to freshen up the top corner, which was looking pretty Earthy, so they blew snow from the top, down to Cafe corner. It should ski great now, and we'll have a nice base depth on Cobrass for spring. Crews have really battled Mother Nature this season, and our pond is starting to look a little low now. We're reevaluating our strategy in the next day or two to figure out what our next move is with the guns and how we want to finish up the year. Trivia Night: Beat the back-to-work blues. Head to the James Moore Tavern for a night of trivia. College Night: Wednesdays starting at noon, students with a current college ID can ski and ride for only $19. Also includes $2 pizza slices. Night Riders: This park event has been a huge success this year. This week's format: Slopestyle. With 7-9" of fresh powder in the last 24 hours, we're in for another powder morning today under bluebird skies. With that in mind, it occurs to me that some people may be visiting us for the first time, or have never experienced powder before. GASP! You're in for a treat. Let me assure you that it's some of the most fun you'll ever have in the Winter, but there's a few things you need to know. Powder skiing & riding is vastly different from lapping groomers all day, and you'll likely hear a bevy of new language and terminology you're unfamiliar with. So, here's a list of key terms to help you find your way through your first powder day. Powder Day: While the qualifying amounts vary from resort-to-resort and even from person-to-person, generally accepted to be any day with at least 6" of new snowfall. In light snow years, amounts greater than 4" may be called a powder day. Powder: The fluffy stuff. There are two kinds - heavy wet and light dry. Think of heavy wet powder as the kind you'd make snowmen out of. It's sticky and hard to gain any speed on the hill, but we love it because it helps build up our base. Light dry powder (also called champagne powder) is, well, really light! If you've seen some "powder shots" in magazines, those ones where skiers just burst through a cloud of snow, that's the dry stuff. Easy to float on top of and easy to keep up your speed. Pow/powpow/Gnar/Shred Sugar/White Gold: Other terms skiers & riders use when referring to powder. Varies with age and geographic location. Wahooooooo! : One of many sounds a skier or rider may expel when dipping and diving through deep snow on a powder day. You'll develop your own without even realizing it. Primo/Sick/Wicked/Stellar/**insert other adjective here**: Terms used by skiers and riders to describe the conditions and whatever line they just took through fresh powder. "No friends on a powder day! ": A popular phrase meaning, "Hey, good friend of mine, when it's snowing this hard, I sure will leave you at home or start my day at the lift without you unless you gear up in a timely fashion. I don't want to miss out on fresh lines because you took your sweet time making breakfast!" Giggling or continued laughter: Typically happens within or immediately after the first few turns in fresh powder. That moment when you realize, "oh em gee, this is going to be a blast!" Silence: Because when it's snowing, everything is quiet. It doesn't make a sound when it's falling, or when you're gliding over top of it. And remember, if you keep passing people with huge stupid grins on their face all day, or you can't keep one off your own, you're doing it right. Now get after it!